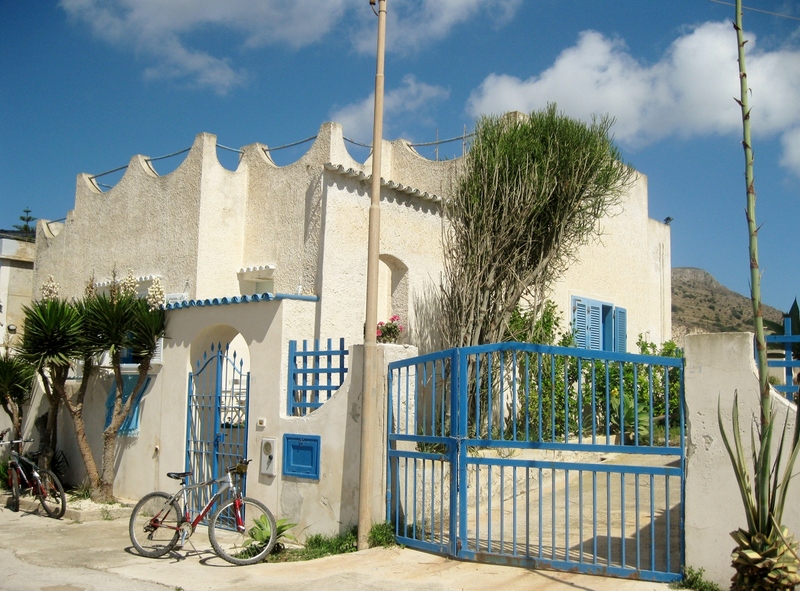 Being a small island, Favignana is very easy to get around by scooter or bike. In fact, most people you come across in the island either are riding scooters or bikes. Another option is renting a boat, but we refrained from doing so because we were only staying for three days. 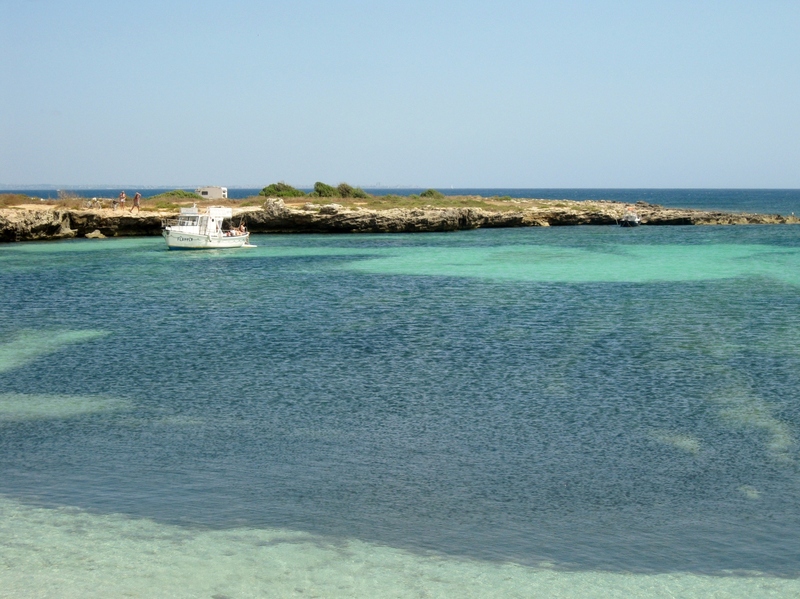 Had we had a week in Favignana, we would have definitely rented a boat. 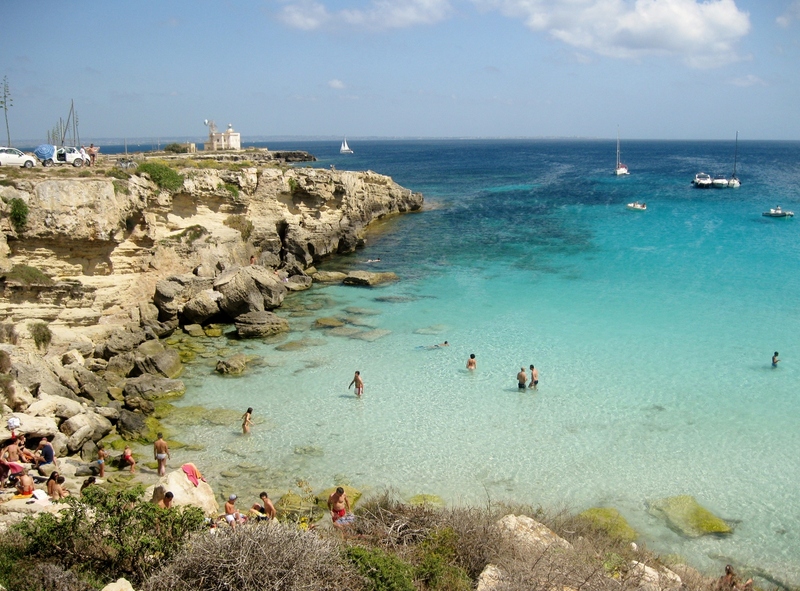 The best way to discover Italian seacoast is by boat. 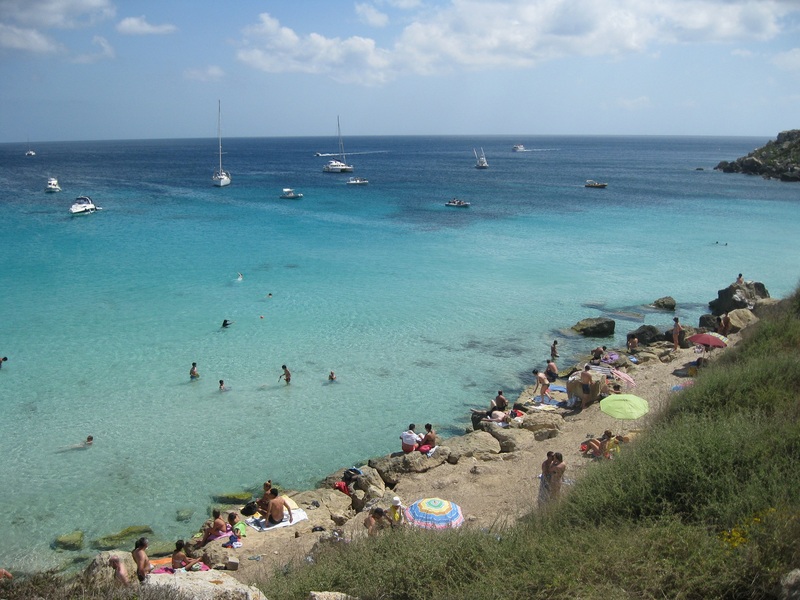 Being able to take a bath while admiring the Mediterranean coast from the sea is an experience worthwhile trying. 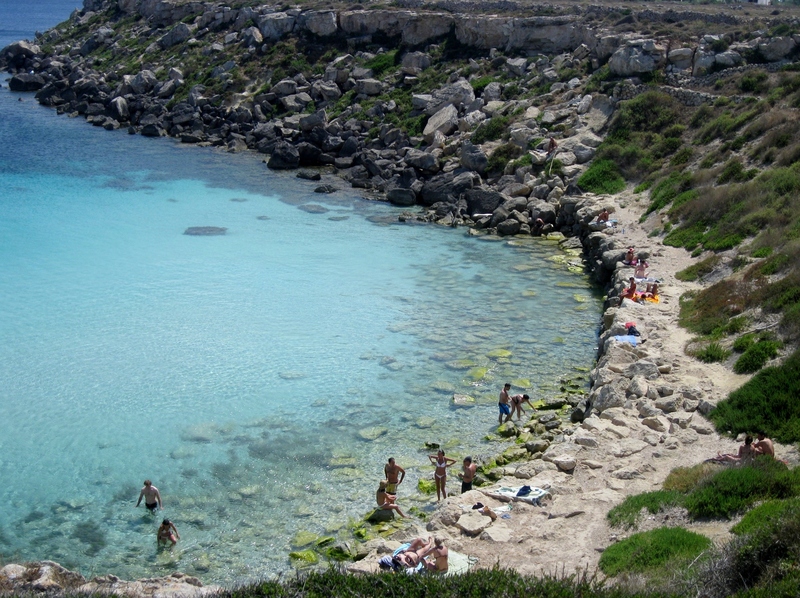 After visiting the east part of the island in Day 1 of our trip (Tales from Favignana, Sicily Part 1), the next day we headed to Favignana’s west coast – Punta Sottile. 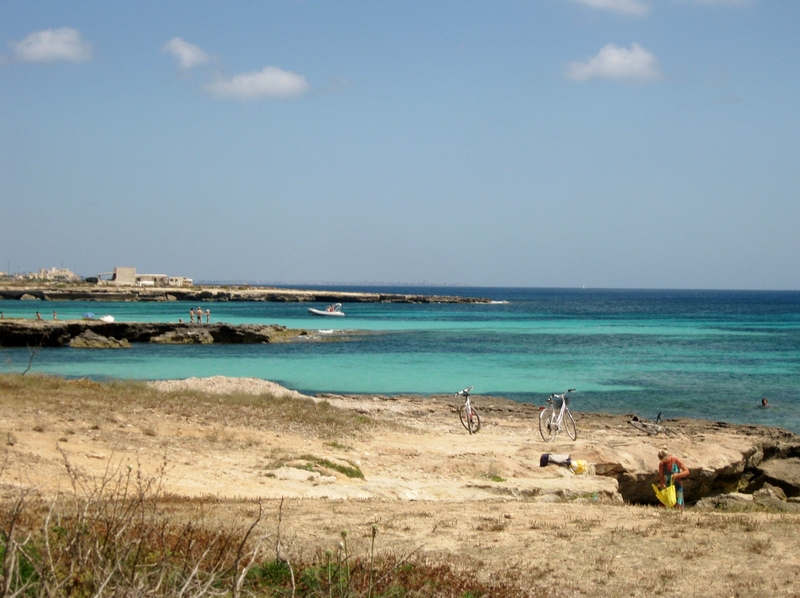 Driving around the island – on our way to Punta Sottile – we discovered some amazing sightseeing spots. 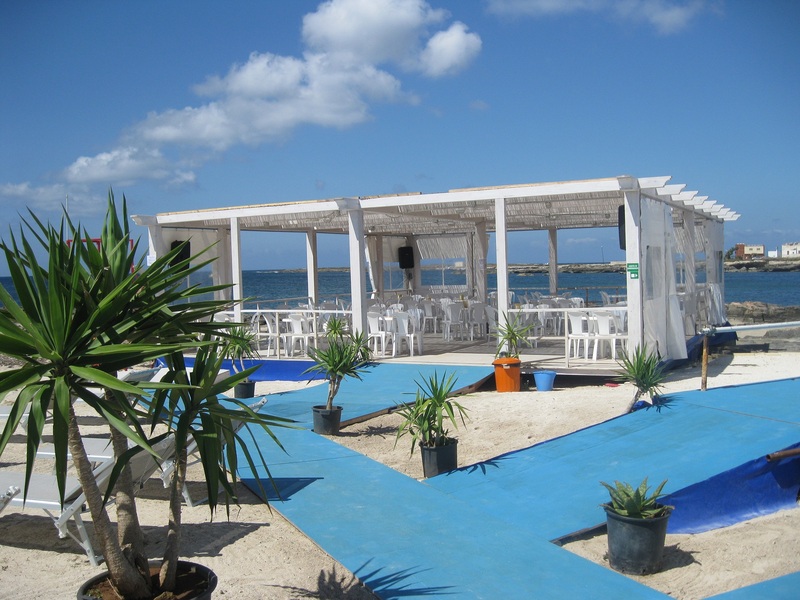 Since we were lucky to have great sunny weather and nice breeze, we could enjoy beautiful panoramic views. 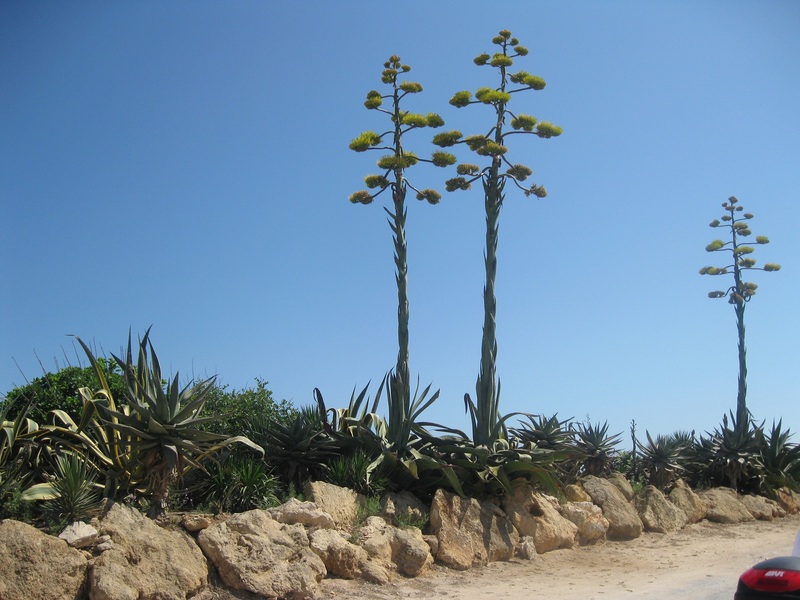 Even though Favignana is a barren island, it has interesting varieties of plant species such as the one in the picture below. I was still listening to – what I decided was the song of our trip – Fly to me – Keane, when I saw this house. I get a beautiful picture in my mind while hearing this song: a nice small house by the Mediterranean sea. Notice the lovely contrast of the white construction and the blue details of the front gate and the windows. I totally loved the parked bikes outside the house. 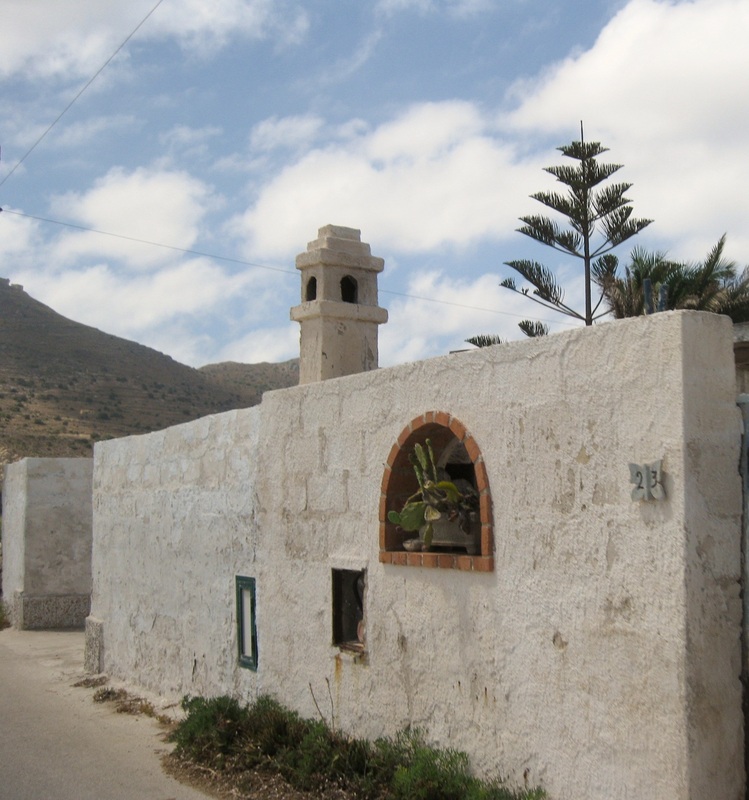 When building houses in Favignana, Sicilian architects tried to make the most of the available resources like tuff stone (tufo in Italian). 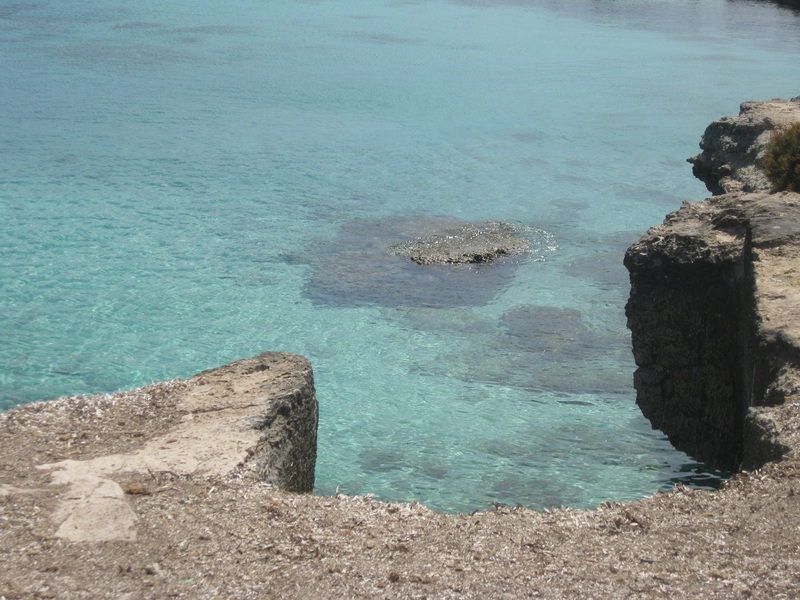 The use of tuff stone – according to islanders – is natural and suitable for constructing in Favignana. The thick tuff walls surrounding these houses provide protection from hot weather, as well as keep them warm in the winter. 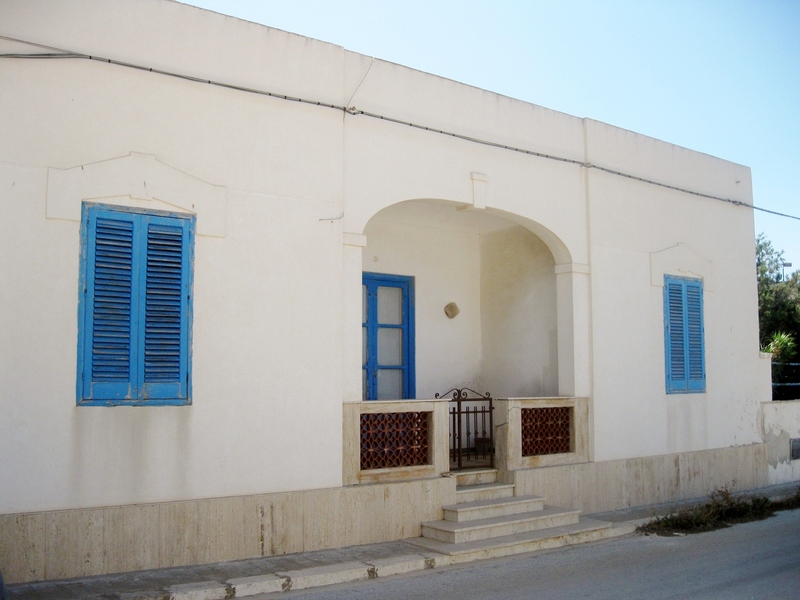 One of the things I admire the most about Favignana is the simple, yet intriguing Mediterranean style of its houses. After having our dose of Favigana’s Architectural Digest, we decided it was time to take a bath!! It was getting hot!!! From this location, we had a stunning view of Mount Saint Catherine. Despite the beauty of the water, it was incredibly cold. 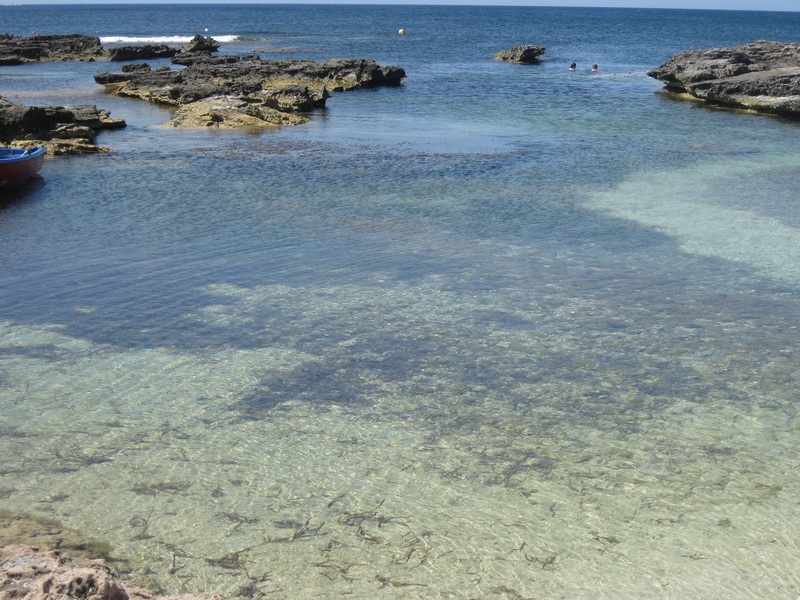 Another view of Punta Sottile’s crystal clear water. Observe the peaceful and quietness of this place. And the simple life of the sea. 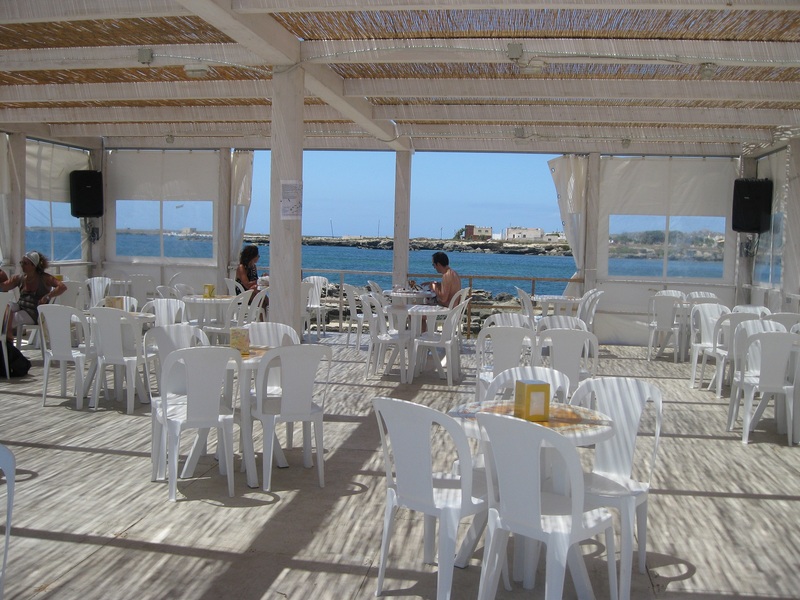 The establishment had a nice terrace overlooking Punta Sottile. We ordered Pane Cunzato meaning “Seasoned Bread”. In Sicily typical bread is made using durum wheat semolina and topped with sesame seeds (the use of sesame seeds recalls Arabic influence). The crust is crunchy and the inside is soft: perfect for a sandwich! 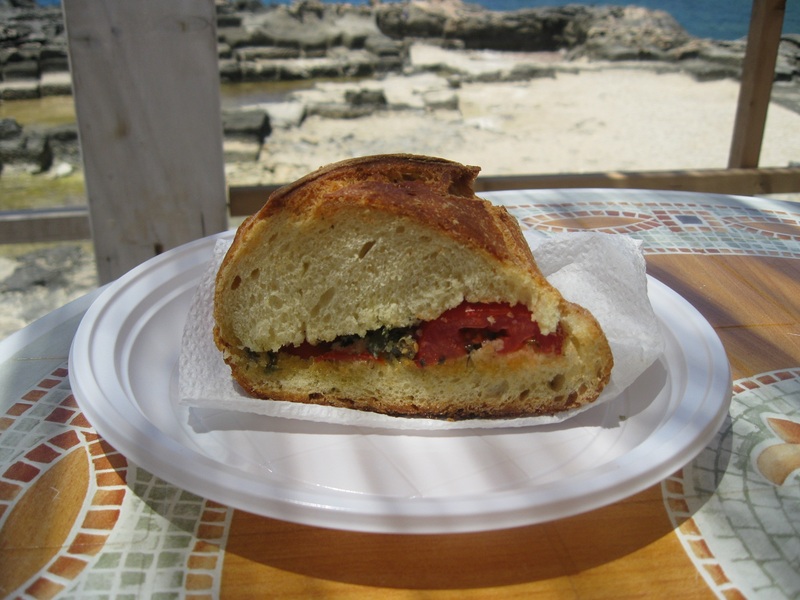 So this Seasoned Bread was just a sandwich – and whatta sandwich – filled with fresh sliced plum tomatoes, oregano, extra virgin olive oil, capers, anchovies, salt, and pepper. 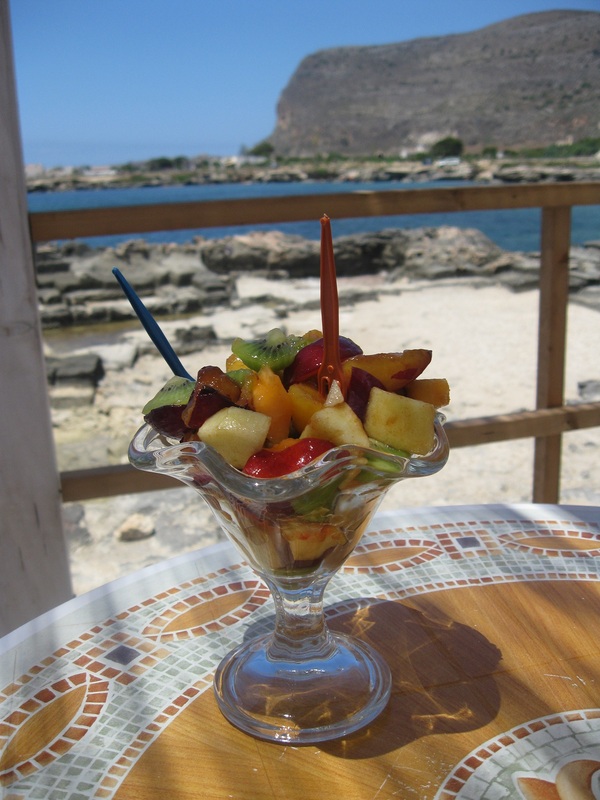 We wanted to stay light during lunch because we had reservations at a traditional Trattoria for dinner so we had a Macedonia di Frutta – Fruit salad. And we finished with coffee and almond granita!!! 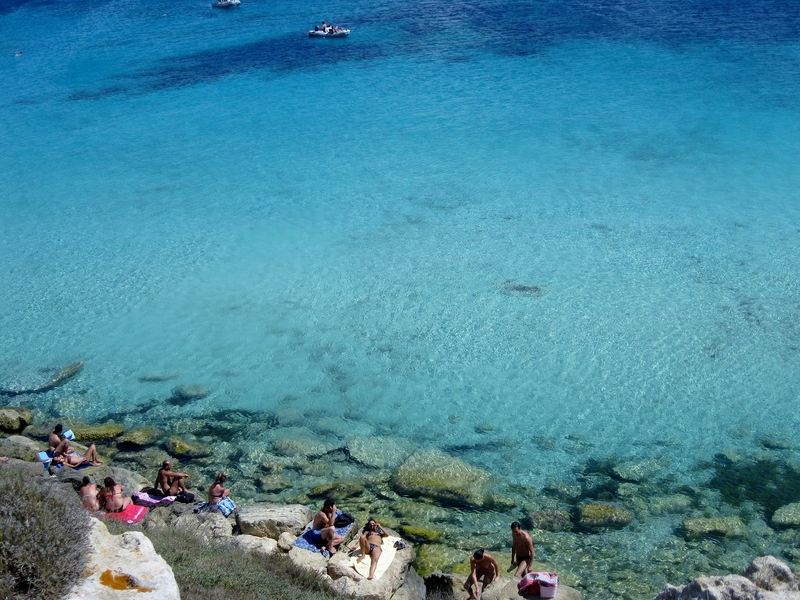 After spending most of the afternoon at Punta Sottile, we then moved to the southwest to discover the most beautiful beach of Favignana – Cala Azzurra. Despite the hurdles we went through getting access to the beach, it was totally worth it. The color of the water is unbelievable. Unless you see it with your own eyes, you will know what I am talking about. 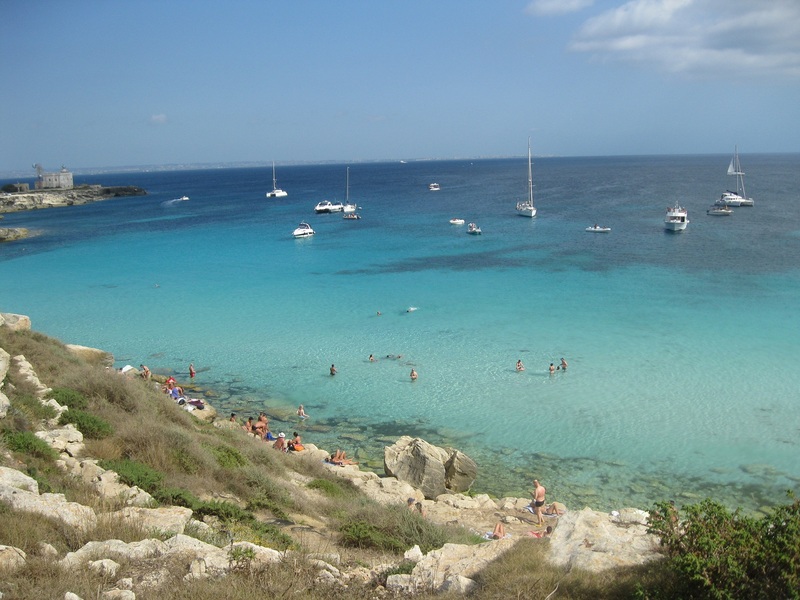 Another breathtaking view of Cala Azzurra. Look at all the boats parked along the coast. Following our bath in Cala Azzurra, we were going back to the hotel when we noticed the most funny, bizarre, cutest thing along the roadside – an orange shaped fruit and beverage bar!! 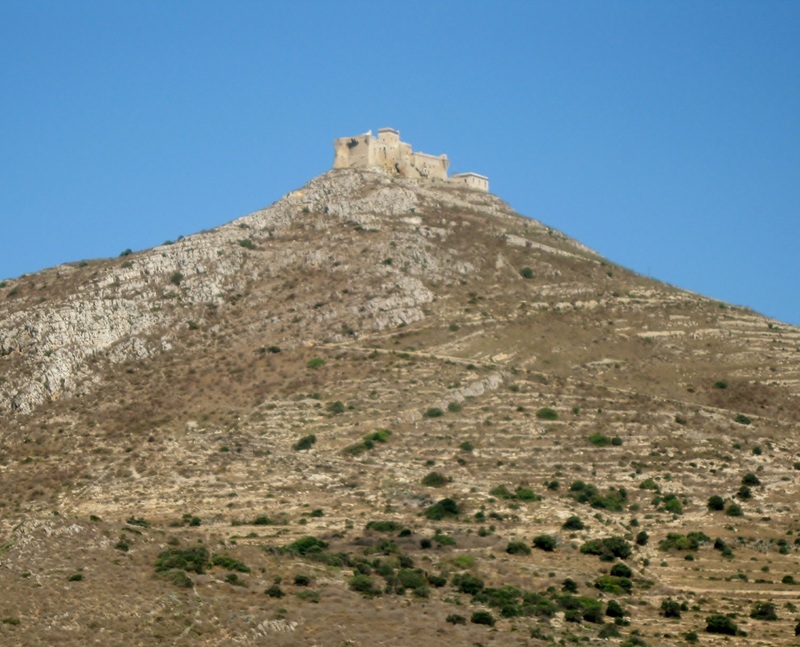 Sicily is well-known – nation and worldwide – for its delicious citrus fruits (mainly oranges and lemons). Therefore, only in Sicily you could have found such a catchy, and creative idea!! I thought the orange shaped motorcycle trunk was hilarious! We got this one of a kind drink – freshly squeezed orange juice with lemon granita. Very refreshing!! So beautiful. And this is the second reference I’ve seen today to almond granita. I’m going to take it as a sign. Oh wow, my travel longings are back! 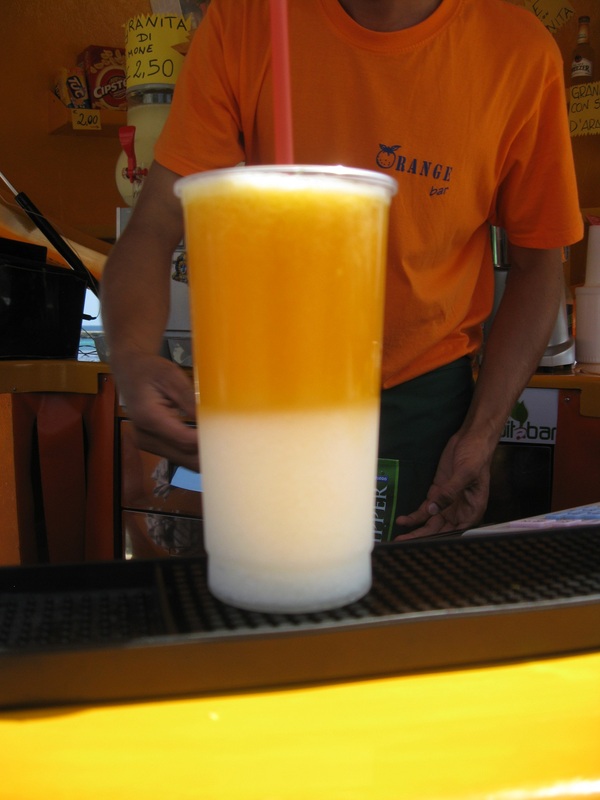 Orange juice with lemon granita, I need some now! 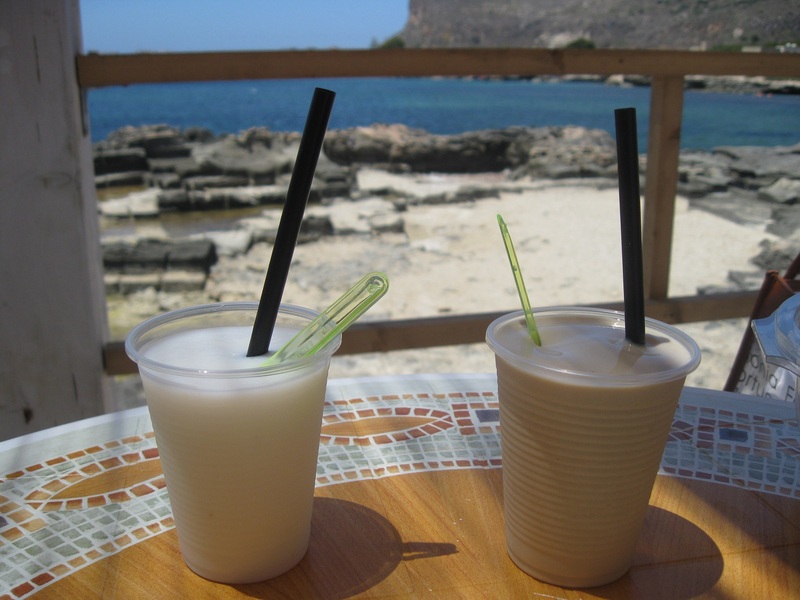 I had never seen it before but I guess it is a very common southern Italian drink! Everything is gorgeous! From the blue, blue water and skies to the whitest beaches; the food…omg I could eat that Seasoned Bread!, the drinks!, the homes, the bikes…I’m dieing here sitting at my office desk wanting to see this myself so badly! I so thank you for sharing this, taking the time to post; it is truly so appreciated! p.s. okay, the orange bar was cute, but it was the cute Sicilian that really caught my eye! Excellent observation!! Italian guys are known to be very very handsome!!!! jejejeje.